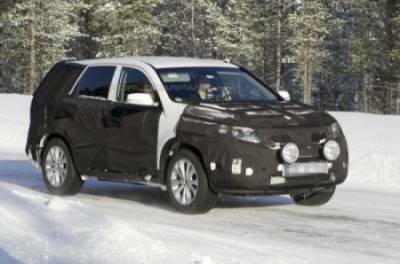 An updated version of the prototype Kia Sorento came under sights spy cameras during tests of snow in Sweden. The current generation of crossover was launched in 2010, so the novelty is expected in 2013 or 2014 model year. See you spy photos inside the publication. Unfortunately, the new Kia Sorento has been abundantly closed camouflage, but it's hard not to notice simulated headlights that look in style hatchback Kia Cee'd. Also striking restyled rear lights and bumper. As for powertrains, the experts do not expect anything new. Most likely the current range of engines will be upgraded to improve performance a little bit of power, as well as reduce emissions.